Receiving by the new telegraph the news that James K. Polk had been elected to the Presidency in November 1844, President John Tyler interpreted the verdict as a mandate from the people for the annexation of Texas, since Polk had come out strongly in favor of annexation. On March 1, 1845, Congress jointly resolved to admit Texas into the Union and the Mexican Government promptly broke off diplomatic relations. President Polk continued to hope that he could settle by negotiation Mexico's claim to Texas and acquire Upper California by purchase as well. In mid-June, nevertheless, anticipating the Fourth of July acceptance by Texas of annexation, he ordered Bvt. Brig. Gen. Zachary Taylor to move his forces from Fort Jesup on the Louisiana border to a point "on or near" the Rio Grande to repel any invasion from Mexico. General Taylor selected a wide sandy plain at the mouth of the Nueces River near the hamlet of Corpus Christi and beginning July 23 sent most of his 1,500-man force by steamboat from New Orleans. Only his dragoons moved overland, via San Antonio. By mid-October, as shipments of Regulars continued to come in from all over the country, his forces had swollen to nearly 4,000, including some volunteers from New Orleans. A company of Texas Rangers served as the eyes and ears of the Army. For the next six months drilling, horsebreaking, and parades, interspersed with boredom and dissipation, went on at the big camp on the Nueces. Then in February Taylor received orders from Washington to advance to the Rio Grande. Negotiations with the Mexican Government had broken down. were waiting, and led on the right to his destination on the Rio Grande, some eighteen miles southwest, opposite the Mexican town of Matamoros. Sending the bulk of his army ahead, Taylor went to Point Isabel to set up his supply base, fill his wagons, and bring forward four 18-pounder siege guns from his ships. At the boiling brown waters of the Rio Grande opposite Matamoros he built a strong fort, which he called Fort Texas, mounting his siege guns. At the same time he sent pacific messages to the Mexican commander on the opposite bank. These were countered by threats and warnings, and on April 25, the day after the arrival at Matamoros of General Mariano Arista with two or three thousand additional troops, by open hostilities. The Mexicans crossed the river in some force and attacked a reconnoitering detachment of sixty dragoons under Capt. Seth B. Thornton. They killed eleven men and captured Thornton and the rest, many of whom were wounded. Taylor reported to President Polk that hostilities had commenced and called on Texas and Louisiana for about 5,000 militiamen. His immediate concern was that his supply base might be captured. Leaving an infantry regiment and a small detachment of artillery at Fort Texas under Maj. Jacob Brown, he set off May 1 with the bulk of his forces for Point Isabel, where he stayed nearly a week strengthening his fortifications. After loading two hundred supply wagons and acquiring two more ox-drawn 18-pounders, he began the return march to Fort Texas with his army of about 2,300 men on the afternoon of May 7. About noon next day near a clump of tall trees at a spot called Palo Alto, he saw across the open prairie a long dark line with bayonets and lances glistening in the sun. It was the Mexican Army. General Arista's forces barring the road to Fort Texas stretched out on a front a mile long and were about 4,000 strong. Taylor, who had placed part of his force in the rear to guard the supply wagons, was outnumbered at least two to one; and in terrain that favored cavalry, Arista's cavalry overwhelmingly outnumbered Taylor's dragoons. But the American artillery was superior. Also, among Taylor's junior officers were a number of West Point graduates who were to make their reputations in the Civil War, notably 2d Lt. George C. Meade and 2d Lt. Ulysses S. Grant. firing solid shot and 12-pounder howitzers firing shell�in quick-moving attacks threw back Arista's flanks. The Mexicans were using old-fashioned bronze 4-pounders and 8-pounders that fired solid shot and had such short range that their fire did little damage. During the battle Lieutenant Grant saw their cannon balls striking the ground before they reached the American troops and ricocheting so slowly that the men could dodge them. During the afternoon a gun wad set the dry grass afire, causing the battle to be suspended for nearly an hour. After it was resumed the Mexicans fell back rapidly. By nightfall when both armies went into bivouac, Mexican casualties, caused mostly by cannon fire, numbered about 320 killed and 380 wounded. Taylor lost only 9 men killed and 47 wounded. One of the mortally wounded was his brilliant artilleryman, Major Ringgold. At daybreak the Americans saw the Mexicans in full retreat. Taylor decided to pursue but did not begin his advance until afternoon, spending the morning erecting defenses around his wagon train, which he intended to leave behind. About two o'clock he reached Resaca de la Palma, a dry river bed about five miles from Palo Alto. There his scouts reported that the Mexicans had taken advantage of his delay to entrench themselves strongly a short distance down the road in a similar shallow ravine known as Resaca de la Guerra, whose banks formed a natural breastwork. Narrow ponds and thick chaparral protected their flanks. Taylor sent forward his flying artillery, now commanded by Lt. Randolph Ridgely. Stopped by a Mexican battery, Ridgely sent back for help and Taylor ordered in a detachment of dragoons under Capt. Charles A. May. The dragoons overran the Mexican guns but on their return were caught in infantry crossfire from the thickets and could not prevent the enemy from recapturing the guns. The pieces were later captured by American infantrymen. Dense chaparral prevented Taylor from making full use of his artillery. The battle of Resaca de la Palma was an infantry battle of small parties and hand-to-hand fighting. The Mexicans, still demoralized by their defeat at Palo Alto and lacking effective leadership, gave up the fight and fled toward Matamoros. Their losses at Resaca de la Palma were later officially reported as 547 and were probably much greater. The Americans lost 33 killed and 89 wounded. In the meantime Fort Texas had been attacked by the Mexicans May 3 and had withstood a two-day siege with the loss of only two men, one of them its commander for whom the fort was later renamed Fort Brown. victory and yelling as they pursued the enemy, had been able to catch up with Arista, they could probably have taken his demoralized army, complete with guns and ammunition. But Taylor had failed to make any provision for crossing the Rio Grande. He blamed the War Department's failure to provide him with ponton equipment (developed during the Second Seminole War), which he had requested while he was still at Corpus Christi. Since that time, however, he had done nothing to acquire bridge materials or boats, although he had been urged to do so by the West Pointers. Lieutenant Meade reported that "the old gentleman would never listen or give it a moment's attention." Not until May 18, after Taylor had brought up some boats from Point Isabel, was he able to cross into Matamoros. By that time Arista's army had melted away into the interior to rest, recoup, and fight another day. On the evening of May 9, the day of the battle of Resaca de la Palma, President Polk received a message from the War Department telling of the attack on Captain Thornton's detachment on April 25. Polk, who was already convinced by the breakdown in negotiations with Mexico that war was justified, immediately drafted a message declaring that a state of war existed between the United States and Mexico. Congress passed the declaration and Polk signed it on May 13. Congress then appropriated $10 million and substantially increased the strength of the Army. After the Second Seminole War the authorized strength had been cut from 12,500 to 8,500. This had been done by reducing the rank and file strength of the regiments, instead of eliminating units, thus firmly establishing the principle of an expansible Army. To meet the needs of the Mexican War the Congress raised the authorized enlisted strength of a company from 64 to 100 men, bringing the rank and file up to 15,540, and added a regiment of mounted riflemen and a company of sappers, miners, and pontoniers. Also, the President was authorized to call for 50,000 volunteers for a term of one year or the duration of the war. for Santa Fe, ultimately to continue to San Diego on the coast of California; part of Kearny's forces under Col. Alexander W. Doniphan was later sent south through Chihuahua to Parras. Polk was counting on "a brisk and a short war"; not until July did he and his Secretary of War, William L. Marcy, even begin to consider the possibility of an advance on Mexico City by landing a force on the Gulf near Vera Cruz. General Scott was not so optimistic. He was more aware of the problems of supply, transportation, communications, and mobilization involved in operations against Mexico, a country with a population of seven million and an army of about thirty thousand, many with experience gained by some twenty years of intermittent revolution. Scott's preparations seemed too slow to Polk. Ostensibly for that reason, but also because success in the field might make Scott a too powerful contender for the Presidency, Polk decided not to give him command of the forces in the field. When news came of the victories at Palo Alto and Resaca de la Palma, Polk promoted Zachary Taylor to the brevet rank of major general and gave him command of the army in Mexico. Taylor's plan was to move on Monterrey with about six thousand men via Camargo, a small town on the San Juan River, a tributary of the Rio Grande about 130 miles upriver. From Camargo, where he intended to set up a supply base, a road led southwest about 125 miles to Monterrey in the foothills of the Sierra Madres. His troops were to march overland to Camargo, his supplies to come by steamboat up the Rio Grande. But he could not move immediately because he lacked transportation�partly because of his failure to requisition in time and partly because of the effort required to build more wagons in the United States and to collect shallow-draft steamboats at river towns on the Mississippi and the Ohio and send them across the Gulf of Mexico. Ten steamboats were in operation at the end of July, but wagons did not begin arriving until November, after the campaign was over. To supplement his wagon train, reduced to 175, Taylor had to rely on 1,500 Mexican pack mules and a few native oxcarts. In manpower Taylor had an embarrassment of riches. May saw the arrival of the first of the three-months militia he had requested on April 26 from the governors of Texas and Louisiana, and with them thousands of additional six-months volunteers from neighboring states recruited by Bvt. Maj. Gen. Edmund P. Gaines, commander of the Department of the West, on his own initiative�a repetition of his impulsive actions in the Second Seminole War. More than 8,000 of these short-term volunteers were sent before Gaines was censured by a court-martial for his unauthorized and illegal recruiting practices and transferred to New York to command the Department of the East. Very few of his recruits had agreed to serve for twelve months. All the rest were sent home without performing any service; in the meantime they had to be fed, sheltered, and transported. In June the volunteers authorized by Congress began pouring into Point Isabel and were quartered in a string of camps along the Rio Grande as far as Matamoros. Regiment under a West Point graduate recently elected to Congress, Col. Jefferson Davis. The mounted riflemen had percussion rifles; the infantrymen were armed with flintlock muskets. Taylor placed great reliance on the bayonet. He had a low opinion of artillery, and though warned that field pieces were not effective against the stone houses of Mexican towns, he had in addition to his four field batteries only two 24-pounder howitzers and one 10-inch mortar, the latter his only real siege piece. By September 19 Taylor's army reached Monterrey, a city of stone in a pass of the Sierra Madres leading to the city of Saltillo. It was strongly fortified and defended by more than 7,000 Mexicans with better artillery than the Mexicans had had at Palo Alto�new British 9- and 12-pounder guns. Taylor, encamped on the outskirts of Monterrey, sent out reconnoitering parties accompanied by engineers and on September 20 began his attack. On the north the city was protected by a formidable citadel, on the south by a river; and it was ringed with forts. Taylor sent one of his Regular divisions, with four hundred Texas Rangers in advance, around to the west to cut off the road to Saltillo, and after a miserable night of drenching rain it accomplished its mission the next day, September 21, though at a cost of 394 dead or wounded, a high proportion of them officers. Taylor placed his heavy howitzers and one mortar in position to fire on the citadel and sent the remainder of his forces to close in from the eastern outskirts of the town. By the third day both attacks were driving into the city proper, the men battering down doors of the stone and adobe houses with planks, tossing lighted shells through apertures, and advancing from house to house rather than from street to street�tactics that were to be used a century later by American troops in Italian and German towns. The climax came when the 10-inch mortar was brought up to lob shells on the great plaza into which the Mexican troops had been driven. On September 24 the Mexican commander offered to surrender on condition that his troops be allowed to withdraw unimpeded and that an eight-week armistice go into effect. Taylor agreed to the proposal. He had lost some 800 men to battle casualties and sickness, besides quantities of arms and ammunition, and he was about 125 miles from his base. Moreover, he believed that magnanimity would advance negotiations for peace which had begun when President Polk allowed General Antonio Lopez de Santa Ana to return to Mexico from exile in Havana to exert his influence in favor of a treaty. men 68 miles southwestward to occupy Saltillo, an important road center commanding the only road to Mexico City from the north that was practicable for wagons and guns. Saltillo also commanded the road west to Chihuahua and east to Victoria, capital of Tamaulipas, the province that contained Tampico, the second largest Mexican port on the Gulf. The U.S. Navy captured Tampico November 15. On the road to Chihuahua was the town of Parras, where General Wool's expedition of about 2,500 men arrived early in December after a remarkable march from San Antonio. On the way Wool had learned that the Mexican troops holding Chihuahua had abandoned it; accordingly, he joined Taylor's main army. Taylor thus acquired a valuable young engineer who had been scouting with Wool, Capt. Robert E. Lee. Taylor was planning to establish a strong defensive line, Parras-Saltillo-Monterrey-Victoria, when he learned that most of his troops would have to be released to join General Scott's invasion of Mexico at Vera Cruz, an operation which had been decided upon in Washington in mid-November. Scott arrived in Mexico in late December. He proceeded to Camargo and detached almost all of Taylor's Regulars, about 4,000, and an equal number of volunteers, ordering them to rendezvous at Tampico and at the mouth of the Brazos River in Texas. Taylor, left with fewer than 7,000 men, all volunteers except two squadrons of dragoons and a small force of artillery, was ordered to evacuate Saltillo and go on the defensive at Monterrey. Enraged, Taylor attributed Scott's motive to politics. Hurrying back to Monterrey from Victoria, he decided to interpret Scott's orders as "advice" rather than as an order. Instead of retiring his forces to Monterrey, he moved 4,650 of his troops (leaving garrisons at Monterrey and Saltillo) to a point about Is miles south of Saltillo, near the hacienda of Agua Nueva. This move brought him almost II miles closer to San Luis Potosi, 200 miles to the south, where General Santa Ana was assembling an army of 20,000. Most of the 200 miles were desert, which Taylor considered impassable by any army; moreover, both he and Scott believed that Santa Ana would make his main effort against Scott's landing at Vera Cruz, the news of which had leaked to the newspapers. On February 8, 1847, Taylor wrote a friend, "I have no fears." by February 19 Santa Ana had 15,000 men at a hacienda at the edge of the desert, only 35 miles from Agua Nueva. The hardest battle of the Mexican War was about to begin. On the morning of February 21 scouts brought the word to General Taylor that a great Mexican army was advancing, preceded by a large body of cavalry swinging east to block the road between Agua Nueva and Saltillo. That afternoon Taylor withdrew his forces up the Saltillo road about Is miles to a better defensive position near the hacienda Buena Vista, a few miles south of Saltillo. There, about a mile south of the clay-roofed ranch buildings, mountain spurs came down to the road on the east, the longest and highest known as La Angostura; between them was a wide plateau cut by two deep ravines. West of the road was a network of gullies backed by a line of high hills. Leaving General Wool to deploy the troops, Taylor rode off to Saltillo to look after his defenses there. By next morning, Washington's Birthday (the password was "Honor to Washington"), the little American army of less than 5,000 troops, most of them green volunteers, was in position to meet a Mexican army more than three times its size. The American main body was east of the road near La Angostura, where artillery had been emplaced, commanding the road. West of the road, the gullies were thought to be sufficient protection. Santa Ana arrived with his vanguard around eleven o'clock. Disliking the terrain, which by no means favored cavalry, his best arm, he sent a demand for surrender to Taylor, who had returned from Saltillo. Taylor refused. Then Santa Ana planted artillery on the road and the high ground east of it and sent a force of light infantry around the foot of the mountains south of the plateau. About three o'clock a shell from a Mexican howitzer on the road gave the signal for combat; but the rest of the day was consumed mainly in jockeying for position on the mountain spurs, a competition in which the Mexicans came off best, and the placing of American infantry and artillery well forward on the plateau. After a threatening movement on the Mexican left, Taylor sent a Kentucky regiment with two guns of Maj. Braxton Bragg's battery to the high hills west of the road, but no attack occurred there. Toward evening Taylor returned to Saltillo, accompanied by the First Mississippi Rifles and a detachment of dragoons. At nightfall his soldiers, shaken by the size and splendid appearance of the Mexican army, got what sleep they could. it was quickly broken up by American artillery and infantrymen, and no further action occurred in that sector. The strongest assault took place on the plateau, well to the east, where Santa Ana launched two divisions, backed by a strong battery at the head of the southernmost ravine. The Americans farthest forward, part of an Indiana regiment supported by three cannons, held off the assault for half an hour; then their commander gave them an order to retreat. They broke and ran and were joined in their flight by adjoining regiments. Some of the men ran all the way back to Buena Vista, where they fired at pursuing Mexican cavalrymen from behind the hacienda walls. About nine o'clock that morning, when the battle had become almost a rout, General Taylor arrived from Saltillo with his dragoons, Col. Jefferson Davis' Mississippi Rifles, and some men of the Indiana regiment whom he had rallied on the way. They fell upon the Mexican cavalry that had been trying to outflank the Americans north of the plateau. In the meantime Bragg's artillery had come over from the hills west of the road, and the Kentucky regiment also crossed the road to join in the fight. A deafening thunderstorm of rain and hail broke early in the afternoon, but the Americans in the north field continued to force the Mexicans back. Just when victory for the Americans seemed in sight, Santa Ana threw an entire division of fresh troops, his reserves, against the plateau. Rising from the broad ravine where they had been hidden, the Mexicans of the left column fell upon three regiments�two Illinois and one Kentucky�and forced them back to the road with withering fire, while the right stormed the weak American center. They seemed about to turn the tide of battle when down from the north field galloped two batteries, followed by the Mississippians and Indianans led by Jefferson Davis, wounded, but still in the saddle. They fell upon the Mexicans' right and rear and forced them back into the ravine. The Mexicans' left, pursuing the Illinois and Kentucky regiments up the road, was cut to pieces by the American battery at La Angostura. in the center of the battle hunched on his horse "Old Whitey," with one leg hooked over the pommel of his saddle, disregarding two Mexican bullets that ripped through his coat, and occasionally rising in his stirrups to shout encouragement, he was an inspiration to his men, who swore by him. Under such a leader they felt that defeat was impossible. Taylor knew little of the art of war. He was careless in preparing for battle and neglected intelligence; he often misunderstood the intention of the enemy and underestimated the enemy's strength. But he possessed to a superlative degree physical courage and moral courage, which according to Jomini are the most essential qualities for a general. mostly militia, at Chihuahua, less than a week after Taylor's victory at Buena Vista. 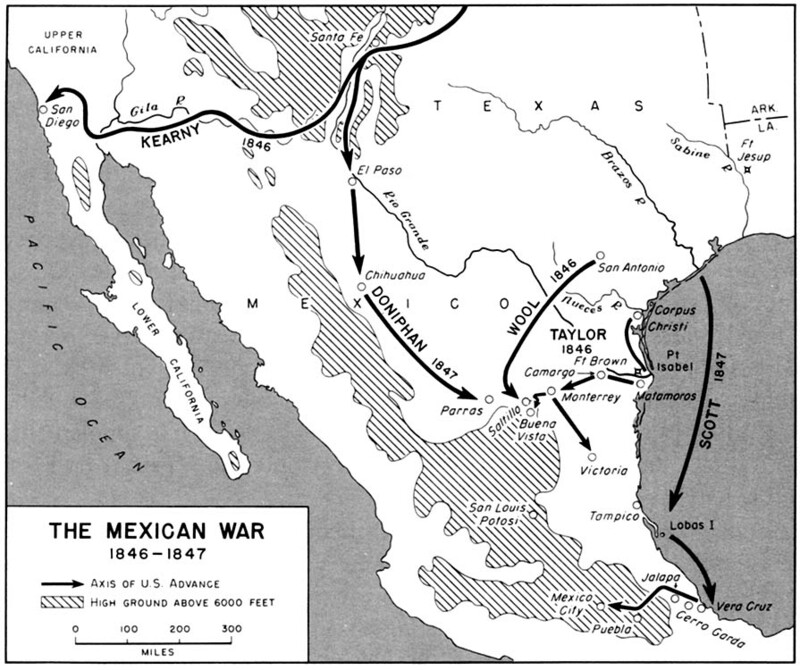 Thus by March 1847, America's hold on Mexico's northern provinces was secure. All that remained was the capture of Mexico City. From a rendezvous at Lobos Island almost 50 miles south of Tampico, General Scott's force of 13,660 men, of whom 5,741 were Regulars, set sail on March 2, 1847, for the landing near Vera Cruz�the first major amphibious landing in the history of the U.S. Army. On March 5 the transports were off the coast of their target, where they met a U.S. naval squadron blockading the city. In a small boat Scott, his commanders, and a party of officers including Robert E. Lee, George G. Meade, Joseph E. Johnston, and Pierre G. T. Beauregard ran close inshore to reconnoiter and came near being hit by a shell fired from the island fortress of San Juan de Ulua opposite Vera Cruz, a shell that might have changed the course of the Mexican War and the Civil War as well. Scott chose for the landing a beach nearly 3 miles south of the city, beyond the range of the Mexican guns. On the evening of March 9, in four hours more than 10,000 men went ashore in landing craft, consisting of 65 heavy surf boats that had been towed to the spot by steamers. The troops proceeded inland over the sand hills with little opposition from the Mexican force of 4,300 behind the city's walls. The landing of artillery, stores, and horses, the last thrown overboard and forced to swim for shore, was slowed by a norther that sprang up on March 12 and blew violently for four days, but by March 22 seven 10-inch mortars had been dragged inland and emplaced about half a mile south of Vera Cruz. That afternoon the bombardment began. Town and fort replied, and it was soon apparent that the mortars were ineffective. Scott found himself compelled to ask for naval guns from the commander of the naval force, Commodore Matthew C. Perry. The six naval guns� three 32-pounders firing shot and three 8-inch shell guns�soon breached the walls and demoralized the defenders. On March 27, 1847, Vera Cruz capitulated. equipped with mountain howitzers and rockets, officered and manned by the Ordnance Corps. The rocket section, mainly armed with the Congreve, carried for service tests a new rocket, the Hale, which depended for stability not on a stick but on vents in the rear, which also gave it a spin like that of an artillery projectile. The rockets were fired from troughs mounted on portable stands. In addition to his two batteries, General Twiggs had a squadron of dragoons, in all about 2,600 men. He advanced confidently, though warned by Scott that a substantial army commanded by Santa Ana lay somewhere ahead. On April II, after Twiggs had gone about 30 miles, his scouts brought word that Mexican guns commanded a pass near the hamlet of Cerro Gordo. Near Cerro Gordo the national highway ran through a rocky defile. On the left of the approaching Americans, Santa Ana with about 12,000 men had emplaced batteries on mountain spurs and on the right of the Americans farther down the road his guns were emplaced on a high hill, El Telegrafo. He thus had firm command of the national highway, the only means he thought Scott had of bringing up his artillery. Fortunately for Twiggs, advancing on the morning of April 12, the Mexican gunners opened fire before he was within range and he was able to pull his forces back. Two days later Scott arrived with reinforcements, bringing his army up to 8,500. A reconnaissance by Capt. 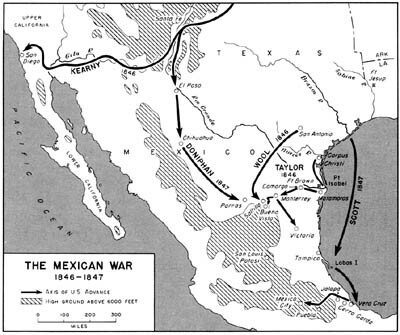 Robert E. Lee showed that the rough country to the right of El Telegrafo, which Santa Ana had considered impassable, could be traversed, enabling the Americans to cut in on the Mexican rear. The troops hewed a path through forest and brush, and when they came to ravines, lowered the heavy siege artillery by ropes to the bottom, then hoisted it up the other side. By April 17 they were able to occupy a hill to the right of El Telegrafo, where they sited the rocket battery. Early on the morning of April 18 the battle began. Though Santa Ana, by then forewarned, had been able to plant guns to protect his flank, he could not withstand the American onslaught. The Mexicans broke and fled into the mountains. By noon Scott's army had won a smashing victory at a cost of only 417 casualties, including 64 dead. Santa Ana's losses were estimated at more than a thousand. the danger of yellow fever when they passed through Vera Cruz. The departure of the volunteers, added to wounds and sickness among the men remaining, reduced the army to 5,820 effectives. In May Scott pushed forward cautiously to Puebla, then the second largest city in Mexico. Its citizens were hostile to Santa Ana and had lost hope of winning the war. It capitulated without resistance on May 15 to an advance party under General Worth. Scott stayed there until the beginning of August, awaiting reinforcements from Vera Cruz, which by mid-July more than doubled his forces, and awaiting also the outcome of peace negotiations then under way. A State Department emissary, Nicholas P. Trist, had arrived on the scene and made contact with Santa Ana through a British agent in Mexico City. Trist learned that Santa Ana, elected President of Mexico for the second time, would discuss peace terms for $10,000 down and $1,000,000 to be paid when a treaty was ratified. After receiving the down payment through the intermediary, however, Santa Ana made it known that he could not prevail upon the Mexican Congress to repeal a law it had passed after the battle of Cerro Gordo making it high treason for any official to treat with the Americans. It was clear that Scott would have to move closer to the capital of Mexico before Santa Ana would seriously consider peace terms. For the advance on Mexico City, Scott had about 10,000 men. He had none to spare to protect the road from Vera Cruz to Puebla; therefore his decision to move forward was daring: it meant that he had abandoned his line of communications, as he phrased it, "thrown away the scabbard." On August 7 Scott moved off with the lead division, followed at a day's march by three divisions with a three-mile-long train of white-topped supply wagons bringing up the rear. Meeting no opposition�a sign that Santa Ana had withdrawn to defend Mexico City�Scott by August 10 was at Ayolta, located on a high plateau 14 miles from the city. The direct road ahead, entering the capital on the east, was barred by strongly fortified positions. Scott therefore decided to take the city from the west by a wide flanking movement to the south, using a narrow muddy road that passed between the southern shores of two lakes and the mountains and skirted a fifteen-mile-wide lava bed, the Pedregal, before it turned north and went over a bridge at Churubusco to the western gates of Mexico City. The Pedregal had been considered impassable, but Captain Lee found a mule path across its southwestern tip that came out at the village of Contreras. Scott sent a force under Bvt. Maj. Gen. Gideon J. Pillow to work on the road, supported by Twiggs's division and some light artillery. They came under heavy fire from a Mexican force under General Valencia. Pillow, manhandling his guns to a high position, attacked on August 19, but his light artillery was no match for Valencia's 68-pounder howitzer, nor his men for the reinforcements Santa Ana brought to the scene. American reinforcements made a night march in pouring rain through a gully the engineers had found through the Pedregal and fell upon the Mexicans' rear on the morning of August no, simultaneously with an attack from the front. In seventeen minutes the battle of Contreras was won, with a loss to Scott of only 60 killed or wounded; the Mexicans lost 700 dead and 800 captured, including 4 generals. Scott ordered an immediate pursuit, but Santa Ana was able to gather his forces for a stand at Churubusco, where he placed a strong fortification before the town at the bridge and converted a thick-walled stone church and a massive stone convent into fortresses. When the first American troops rode up around noon on August no they were met by heavy musket and cannon fire. The Mexicans fought as never before; not until midafternoon could Scott's troops make any progress. At last the fire of the Mexicans slackened, partly because they were running out of ammunition, and the Americans won the day, a day that Santa Ana admitted had cost him one third of his forces. About 4,000 Mexicans had been killed or wounded, not counting the many missing and captured. The battle had also been costly for Scott, who had 155 men killed and 876 wounded. The victory at Churubusco brought an offer from Santa Ana to reopen negotiations. Scott proposed a short armistice and Santa Ana quickly agreed. For two weeks Trist and representatives of the Mexican Government discussed terms until it became clear that the Mexicans would not accept what Trist had to offer and were merely using the armistice as a breathing spell. On September 6 Scott halted the discussions and prepared to assault Mexico City. Though refreshed by two weeks of rest, his forces now numbered only about 8,000 men. Santa Ana was reputed to have more than 15,000 and had taken advantage of the respite to strengthen the defenses of the city. And ahead on a high hill above the plain was the Castle of Chapultepec guarding the western approaches. projectiles from above, his determined troops rapidly gained the summit, and though they were delayed at the moat, waiting for scaling ladders to come up, by half past nine o'clock the Americans were overrunning the castle. Scarcely pausing, they pressed on to Mexico City by the two routes available and by nightfall held two gates to the city. Exhausted and depleted by the 800 casualties suffered that day, the troops still faced house-to-house fighting; but at dawn the next day, September 14, the city surrendered. Throughout the campaign from Vera Cruz to Mexico City General Scott had displayed not only dauntless personal courage and fine qualities of leadership but great skill in applying the principles of war. In preparing for battle he would order his engineers to make a thorough reconnaissance of the enemy's position and the surrounding terrain. He was thus able to execute brilliant flanking movements over terrain that the enemy had considered impassable, notably at Cerro Gordo and the Pedregal, the latter a fine illustration of the principle of surprise. Scott also knew when to break the rules of warfare, as he had done at Puebla when he deliberately severed his line of communications. "He sees everything and counts the cost of every measure," said Robert E. Lee. Scott on his part ascribed his quick victory over Mexico, won without the loss of a single battle, to the West Pointers in his army, Lee, Grant, and many others. As for the troops, the trained and disciplined Regulars had come off somewhat better than the volunteers, but the army on the whole had fought well. Scott had seen to it that the men fought at the right time and place. Grant summed it up: "Credit is due to the troops engaged, it is true, but the plans and strategy were the general's." For two months the only responsible government in Mexico was the American military government under Scott. The collection of revenues, suppression of disorder, administration of justice, all the details of governing the country were in the hands of the Army. When the Mexicans finally organized a government with which Commissioner Trist could negotiate a peace treaty, dispatches arrived from Washington instructing Trist to return to the United States and ordering Scott to resume the war. Knowing that the Mexicans were now sincerely desirous of ending the war and realizing that the government in Washington was unaware of the situation, both Trist and Scott decided to continue the negotiations. in Mexico. Not until May 30 were ratifications exchanged by the two governments. Preparations began immediately to evacuate American troops from Mexico. On June 12 the occupation troops marched out of Mexico City, and on August 1, 1848, the last American soldiers stepped aboard their transports at Vera Cruz and quitted Mexican soil. By the Treaty of Guadalupe Hidalgo the United States agreed to pay Mexico $15 million and to assume the unpaid claims by Americans against Mexico. In return Mexico recognized the Rio Grande as the boundary of Texas and ceded New Mexico (including the present states of Arizona, New Mexico, Utah, and Nevada, a small corner of present-day Wyoming, and the western and southern portions of Colorado) and Upper California (the present state of California) to the United States. The victory over Mexico, as well as the settlement of the Oregon boundary frontier in June 1846, added to the United States a vast territory that was to occupy the Army almost exclusively in the postwar years. The first task was exploration, one in which the Corps of Topographical Engineers played the leading role. Some knowledge of the new frontier had been gained by expeditions such as those of Bonneville, Kearny, and Fremont; more had been gained during the Mexican War by "topogs" attached to Kearny's march to California and Wool's to Saltillo and after the war by Maj. William H. Emory's work with the Mexican Boundary Commission, but much still remained to be done. The most significant and far-reaching explorations were those to locate routes for transcontinental railroads. The first effort was directed toward the southwest, an "ice-free, mountain-free" route. In that area the necessity for defense against Comanches, Apaches, and Navahoes meant that most of the Army had to be stationed between San Antonio and Fort Yuma. Forts had to be constructed, roads built, rivers sought as avenues of supply, and Indian trails mapped. In 1853 Congress authorized similar explorations on a northern route to the Pacific from Chicago and a central route from St. Louis. that the Mormons in Utah were defying federal authority, two sizable expeditions were sent from Fort Leavenworth to Utah, but the "Mormon War" never became a reality. Army expeditions, marching through primitive country where no local procurement was possible, had to carry all requirements, from horseshoe nails to artillery. Supplying the frontier posts, some as far as a thousand miles from inland waterways, entailed great effort. All goods had to be hauled in wagons or carried by pack train. The difficulty of supplying posts in the arid regions of the Southwest led in 1855 to an interesting experiment, strongly backed by Secretary of War Jefferson Davis, in the use of camels as pack animals. Seventy-five were imported from the Middle East and sent to Texas. They showed that they could carry heavy loads, walk surefootedly over ground no wagon could traverse, and subsist by grazing and on little water; but their appearance on the roads stampeded wagon and pack trains, and teamsters hated and feared them. The public and the Army turned against them and the camel experiment ended in failure. Scott and Secretary of War George W. Crawford, Congress in June 1850 approved enlarging the companies serving on the frontier to 74 privates, a considerable increase over the 50 in the dragoons, 64 in the mounted rifles, and 42 in the artillery and infantry authorized at the end of 1848. Thereafter 90 of the 158 companies were enlarged, so that by the end of 1850 the Army was authorized 12,927 officers and men. When Jefferson Davis became Secretary of War in 1853, he strongly urged a larger Army, one that could be expanded to 27,818 men in time of war by enlarging the company to 128 men. Davis desired new mounted regiments for frontier service, because only highly mobile units could hope to handle the Indians. In March 1855 Congress added 4 new regiments to the existing 15 (2 of dragoons, 1 of mounted rifles, 4 of artillery, and 8 of infantry). They were the 1st and 2d Cavalry Regiments and the 9th and 10th Infantry Regiments. The mounted arm thus consisted of dragoons, mounted rifles, and cavalry until the Civil War, when all mounted regiments were called cavalry. At Davis' insistence the new infantry units were armed with percussion-cap, muzzle-loading rifle muskets instead of smoothbore muskets. Nineteenth century technological developments had made possible an accurate, dependable muzzle-loading rifle with at least as fast a rate of fire as the smoothbore musket. This was partly due to the application of the percussion-cap principle to the rifle and partly to the adoption in 1855 of the Minié ball, a lead projectile tapering forward from its hollow base. To load and fire, the soldier bit open the paper cartridge, poured the powder down the barrel, rammed in the paper to seat the charge, and then rammed the bullet home. He then put the cap in place, full-cocked the piece, aimed, and fired. Sparks from the cap fired the powder. The force of the explosion expanded the hollow base of the bullet to fit the rifling, and the bullet left the barrel spinning, and thus with considerable accuracy. Its effective range was about 400 to 600 yards as compared with 100 to 200 yards for smoothbore muskets. The rate of fire was a theoretical three rounds a minute, though this was seldom attained in practice. the breech. Many breechloaders were on the market in the 1850's and the Army began testing all available models but did not complete its tests before 1861. Effective breech-loading rifles required metallic rather than paper cartridges to prevent escape of gases at the breech. Metallic cartridges were invented in 1856 but were not produced in large numbers until after 1861. The introduction of rifling into field and coast artillery increased the accuracy and more than doubled the effective range; but rifled guns, which had to await the development of advanced manufacturing techniques, did not immediately supplant the smoothbores. During this period an important smoothbore piece was introduced for the light batteries, the 12-pounder bronze cannon called the "Napoleon" for Napoleon III. Capt. Robert P. Parrott's rifled cannon was developed in 1851 but did not come into use on an appreciable scale until the Civil War. The application of the Minie principle to artillery did much to further the use of rifled artillery, though grape and canister, shell (high explosive and shrapnel), and solid shot, all used in the Mexican War, were still standard. Rockets declined in favor. The brief experience with them in the Mexican War had not been impressive. After the war, continued experimentation failed to remove faults of eccentricity in flight and instability. The rockets often exploded prematurely, so that troops were reluctant to use them; moreover, they tended to deteriorate in storage. More important than any of these considerations was the fact that the new rifled artillery was decidedly superior to rockets in range and accuracy. Tactical doctrine did not entirely keep pace with the development of weapons. In an effort in that direction, Secretary Davis prescribed light infantry tactics for all infantry units. In general, this meant reducing the line of the infantry from three to two ranks and placing increased emphasis on skirmishers. Formations, however, were still rigid: men stood shoulder to shoulder (it was almost impossible to load a muzzle-loader lying down) and intervals between units were small. These relatively dense formations would, in the early days of the Civil War, offer inviting targets. European military institutions and development in general. The study of American military theory was stimulated by the publication in 1846 of Henry Wager Halleck's Elements of Military Art and Science. Such volumes as Scott's Instructions for Field Artillery, the General Regulations for the Army of the United States, Hardee's Tactics, and the new volume on infantry tactics sponsored by Davis were made available to Army officers and a few others, although not enough were obtained to furnish copies to the militia. A number of military schools had been founded throughout the country, with the South having a slight edge, an advantage that was to provide officers to the Confederacy when the Civil War broke out.